This topic had me going through the cupboards looking for Albert, the dead cicada, the dead dragonfly and other entomological oddities we've collected over the years. I found him in a shoebox full of junk. Cicadas are cute appealing creatures, with their froggy faces and musical habits. They always remind me of something out of Hayao Miyazaki's extraordinary manga saga, Nausicaa of the Valley of Wind (yeah, I know there's also a film, but it's one of the few Miyazaki's I haven't yet seen). A lot of Summers up along the Murray, J and L collect bucketfuls of cicada skins off the sides of trees. The hollow skins are fascinating things (Jill's older sister is irrationally terrified of them) - if I'd had one I would've drawn that as well. Albert's different though - he's actually a whole dead cicada, perfect and green - I don't know how he died. Cicadas live most of their lives underground, though they're far more familiar in their noisy form, after they've emerged, shed their skins and flown off. When we first moved in to our current house a couple of newly hatched cicadas turned up, sitting around until they felt motivated to move on. Most were green, but one was a bright orange and black (I'm sorry I didn't draw it), and I ended up taking it into the bush and getting it to fly off, as it seemed to really be losing the plot. I had planned to colour this black and white drawing in Photoshop, but with a morning that began with a broken zipper and burst radiator hose (on the car), and continued with some guys turning up to look for climbing galaxids in our creek, it was not to be :). In colour, the lines of the transparent wings would be green trimmed with yellow, the body a darker green, and gold trim on various edges. On a live cicada the legs wouldn't be folded up either. 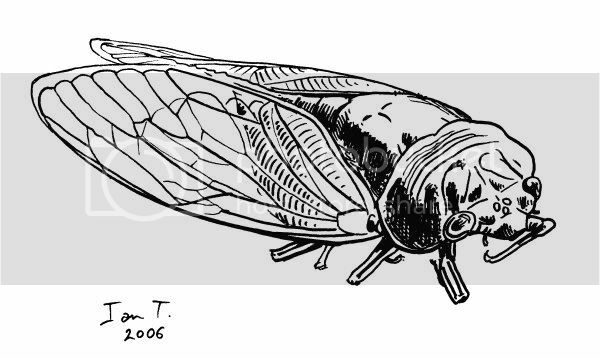 This is interesting, not only because it is a nice, simple drawing of a cicada, but because of the story behind it. I didn't quite get it, though: was Albert already dead when you found him, or did you have him for awhile and name him while he was still alive? Thanks, Cindy, no, he was found and named as a ex-cicada... otherwise I'd have had to write a longer essay :). i like a drawing when it's posted on a closer range like this-beautiful and i can explore more that i actually imagined the colors while i was reading it. the wings are great. i guess-you have given a name all the animals that can be found in your house and area-cool! I do so like this. And "Albert" seems fitting somehow. Cicadas are back home musak to me! Would love to have seen orange one! Please drop by my place.. need advice. Guy advice would BEE great! Ian, I would just love to see you do this in color when (or if) you find the time. Your description makes me really want to see how you will do it. I don't know that I'd call cicadas cute, but they are quite amazing to look at. I've also picked up and held onto a few dead ones over the years. Your drawing is excellent! Cicadas live in our beach house - T. hates them but I tell her they're just looking after the place when we're not there. The other day a large one dropped itself in my water glass during the night. I came out to get a drink of water in the morning and nearly swallowed the crunchy, hairy thing. I usually just throw them out the back door - this time a magpie was there and gratefully ate it. great work as always Ian!